Vault of Light: Getting heavily into Pet Battles! Getting heavily into Pet Battles! World of Warcraft has been felling a little bit stagnant recently. Leveling, reputations and even auction housing have become a bit tiresome. I began leveling what'll be my seventh character to ninety but I'm just not feeling it. The only reputations I have left to complete are August Celestials and The Anglers. AC are already part way though revered so it shouldn't take long. I'm excited about patch 5.2 although I'm not expecting it this week. The new daily quest hub as well as the new raid content will make for a refreshing change. If you haven't already, you can read the 5.2 patch notes on Wowhead. One thing I have been getting into this week though is Pet Battling. Having never played Pokemon as a kid Pet battling wasn't something I was super interested in to begin with. Hell I didn't even like the cartoon! Although I do like the theme tune. Since the beginning of MoP I've done a little bit of dabbling but not a great deal. I began simply by just collecting pets. With a team of three I traveled across Eastern Kingdoms collecting any rare quality pet I came across. Up until my pets began hitting double numbers in level it became a little more difficult than just pitting my three random pets against both the trainers and some of the wild pets I came across. I raised my first pet to level twenty five last week. My faithful Shore Crab which was the first rare pet I found in Westfall and he's continued to be a really strong pet. 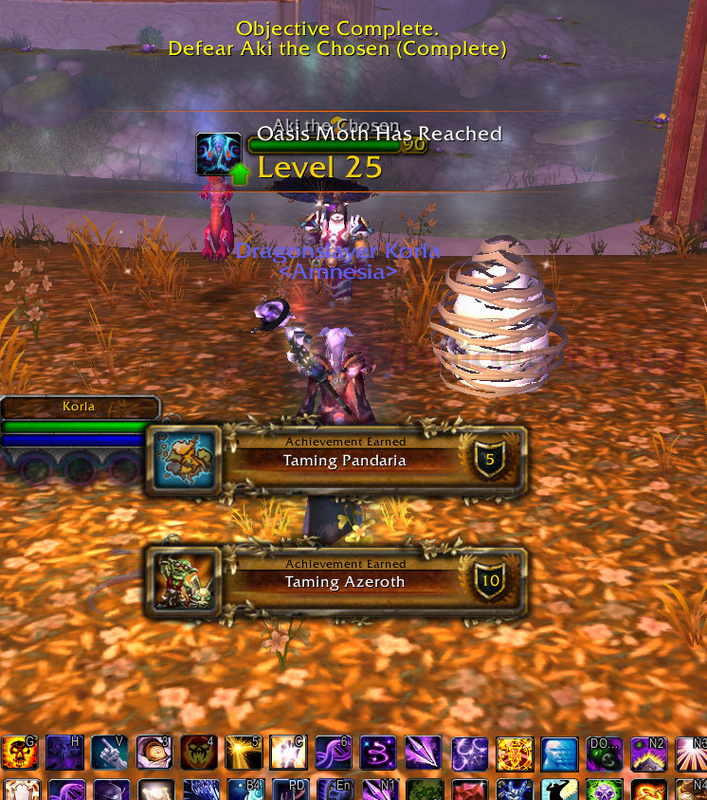 Hitting twenty five opened up the ability to purchase level twenty five pets from the Auction House. I picked myself up a level 18 Anubisath Idol for 3k as well as a level 23 Pandaren Water Spirit for 6k because I think he's super cute. The Anubisath Idol has proven invaluable. He's been a fantastic pet! Throughout the week I've began battling the Grand Master trainers. Some of those fights have been frustrating! Grand Master Payne in Icecrown as well as Grand Master Mo'Ruk in Krasarang Wilds were particularly painful! Grand Master Aki the final trainer in Pandaria was surprisingly easy despite her having three legindary pets! Once you begin on Grand Master quest chain having pet types which counter the trainer's pets becomes important. It also means that with a lot of the trainers you can beat them using only two pets sometimes even one. Leaving your third slot open for a pet you're currently leveling. Using my level twenty one Masked Tanuki in a wild pet battle against three level twenty fives gave me 600 pet xp while wearing my Safari Hat. Using two level twenty fives my Pandaren Water Spirit and my Clockwork Gnome along with my still level twenty one Tanuki against Farmer Nishi's daily quest awarded my Tanuki 3713 xp while wearing my Safari Hat, getting him to level twenty three. Wowhead comments are a great resource for help if you're stuck on any of these tamers. Often in the comments section people will suggest pets which can help with the fights and which pets they used to beat each of the tamers. Taming Pandaria. Taming Azeroth. Pet Battles. Aki was also beaten using only two pets, giving my Oasis Moth that last bit of xp to reach Twenty Five. The pet battles are fun but it really appeals to my collective nature. I love achievements and I've always collected non combat pets so having so many more of them introduced to the game just makes them so much better. Once you complete the series of quests and defeat Aki the Chosen you're able to battle the Pandaren Spirit Tamers. I also beat the Darkmoon Trainer Jeremy Feasel for the first time today. Doing his daily quest gives you a bag which can contain a Darkmoon Eye pet. Have you done much in the way of pet battles? What are some of your favourite pets? Any pets you can recommend that people absolutely have to level?